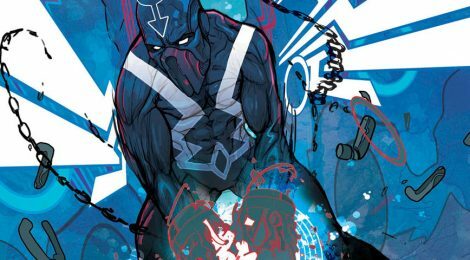 Comic Book Review - Black Bolt #1 by Saladin Ahmed and Christian Ward - Honk if you love justice! The Inhumans are in a tough spot, as far as the fandom goes. They’ve been around a long time, created by Lee and Kirby no less. But they’ve always been a bit of a niche group, mostly centered around the Fantastic Four. It doesn’t help that in modern times, the Inhumans are being pushed hard by Marvel, and it’s seen by some that it’s to the detriment of Marvel’s Mutant characters. I’ve never bought that particular conspiracy theory, but it’s left some fans with a sour taste in their mouths. I’m happy to report that Black Bolt #1 is absolutely worth your time, even if the Inhumans have never been your thing. The story will follow Black Bolt as he’s thrown in a cosmic prison by his brother, Maximus the Mad. It’s for the worst of the worst, and was supposed to be Maximus’s new home. BB’s not alone, however, and chief among the other incarcerated folks is Carl “Crusher” Creel, the Absorbing Man. If you mostly know Marvel from the movies and TV show, he’s made a few appearances on Agents of SHIELD. The writer, Saladin Ahmed, has something to say about prison and what happens when you toss people aside, but promises not to forget about the guy who can shout mountains apart. When you combine that with the insane, trippy art stylings of Christian Ward (ODY-C), I’m definitely in to see what happens next.